Cinematic Keys is indeed, well... cinematic, and we much prefer its unreal, processed sounds to the straight-up pianos, harpsichords and organs (of which there aren't many, admittedly). Truly cinematic. Processed sounds are great. In-depth and flexible. Un-processed sounds and instruments are less interesting and not very cinematic. 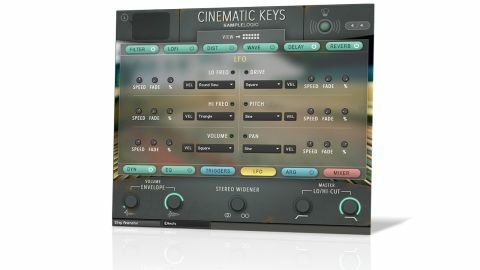 Sample Logic's latest, Cinematic Keys, sees the intrepid developers multisampling all manner of keyboard instruments to come up with over 850 single and multi-layered patches. They're divided up into various categories and sub-categories, covering everything from layered performance instruments, soundbeds and percussion kits to ambiences, loops, sequences, arps and more. "Many of the samples were 'derived from the destruction of upright and toy pianos all recorded in a huge multi-car garage'"
Many of the samples were "derived from the destruction of upright and toy pianos all recorded in a huge multi-car garage", but don't take that to mean this is an outrageously noisy library by any means - there's actually more subtlety and finesse to the sounds than there is cacophony. The interface is split between two main views: Step Animator and Effects. The Step Animator is a powerful combination step sequencer/arpeggiator, first seen in Arpology and unchanged here. It's used to generate elaborate note sequences up to 128 steps in length, incorporating various controllable parameters, headlined by the Step Type and Stutter Rate lanes, and the randomisation system, with which brilliantly glitchy sequences can be cooked up in seconds. The Effects page houses eight effects modules (including Filter, Delay, EQ, convolution Reverb and a very simple synth for layering under the sampled sounds), eight FX Trigger pads (for switching 48 preset effects chains in and out), six pre-assigned LFOs, and a control arpeggiator for gate-sequencing the Trigger pads and LFOs. The effects have nifty per-parameter "FX Animator" step sequencers. Cinematic Keys is indeed, well... cinematic, and we much prefer its unreal, processed sounds to the straight-up, not particularly 'big screen' - and thus arguably kinda pointless - pianos, harpsichords and organs (of which there aren't many, admittedly). We'd also suggest that Sample Logic's Kontakt Scripting is now up there with the mighty Heavyocity when it comes to interface depth and flexibility. Nice work!